The mandate of President of the main opposition Cambodia National Rescue Party (CNRP) H.E. 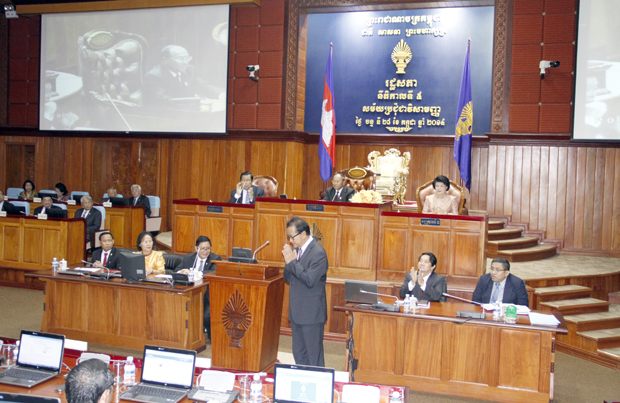 Sam Rainsy as a lawmaker of the 5th legislature was validated in a session of the National Assembly (NA) held here this morning. The NA session was chaired by Samdech Akka Moha Ponhea Chakrei Heng Samrin, President of NA, and attended by Prime Minister of Samdech Akka Moha Sena Padei Techo Hun Sen, Prime Minister of Cambodia, and H.E. Sam Rainsy himself. Speaking to reporters after the NA session, Samdech Techo Hun Sen laid stress on the current good political situation in Cambodia, adding that the Cambodian People’s Party (CPP) and CNRP are preparing the candidacy for the 9 members of the National Election Committee (NEC). For his part, H.E. Sam Rainsy said the political conflict in Cambodia ended. This is a new stage for the national unity, and the protection of the nation’s and people’s interests. On July 22, CPP and CNRP reached a political agreement to end the year-long political crisis following the national election in July 2013. Under the agreement, CPP and CNRP agreed to re-organize the NA’s leadership by dividing the leadership role in the Standing Committee by the 7 to 6 formula, and by establishing another NA’s commission – the Commission on Investigation, Clearance, and Anti-corruption. 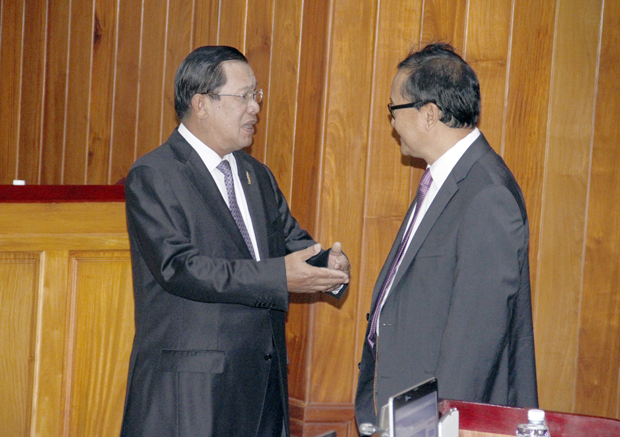 This new commission will be chaired by a CNRP lawmaker. In addition, CPP and CNRP agreed to reform the NEC whose members have to be approved by 50-percent plus one. This independent institution is composed of 9 members (4 selected by the ruling political party, 4 by the political parties that have NA seats, but do not join a coalition with the government, and 1 by the agreement between the political parties having NA seats).